Jovanni Luna is showing new work at Ground Floor Gallery. His solo show, Universal Spaces, includes sculptural paintings exploring the idea of memory. The opening reception will take place this Saturday, June 18th, from 6­-9pm. I stopped by Jovanni’s studio to talk about his work. It was more like stepping into a painting rather than an artist’s studio, as his paintskins had taken over the walls. Below is a slightly condensed version of our conversation. Sibley Barlow: So this is new work, but it’s a continuation of what you have been doing for a while. What is new about what you are doing? that it’s going to end soon. So you’re trying to remember the scent, the sounds, every single texture around you that makes up the space. Even though, as soon as that moment is over it’s starts becoming abstract; you’re not going to remember it all. And as time goes on you’ll remember even less and it just keeps becoming more abstract. SB: Yeah I was actually going to ask you about that. I read that you had talked about memories in relation to your work and process. Are you kind of pulling out your own memories and interacting with them, or are you visually representing memory as an idea? JL:They’re my own memories. But I pick ones that seem a little more general, that more people might have experienced as well. So for this one in the studio here I was thinking of a sunset and that experience of watching one and knowing you’re seeing the sun go down and it’s soon to be over. And that moment, whether you’re by yourself or with someone else watching that sunset, you are trying to retain everything ­ what is going on, your emotions, whatever you are thinking, the actual physical space. Even though, most likely, after the sun goes down, you won’t really remember that sunset. Most likely, you’ll probably create a new memory based on what you know about sunsets, whether it’s images you’ve seen online, or movies or previous sunsets that you’ve already seen. All that is what you’re going to use to create this memory that isn’t actually the one you just experienced! SB: That idea makes a lot of sense with the fact of your process being the most important part of the piece. That’s the same issue you have with not being able to remember things, you have time going by, the process of that, it’s not a condensed thing. JL: Yeah. Even the materiality of it fits well with this, layers of memory, layers of time, the fact that all this paint is donated. So the paint itself has memories attached to it. 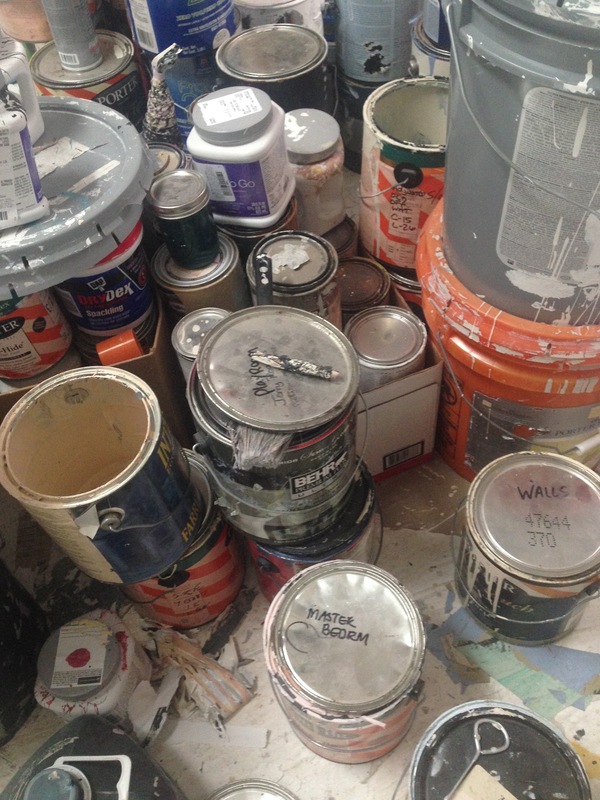 A lot of these cans that people donate have labels, like this one­ “master bedroom” so even the paint itself has a bunch of memories attached to it. SB: How do you go about getting all this paint? JL: The majority of this, this time around has been through craigslist, I just made a post asking for paint. but the way it started was by me writing up a letter in grad school, explaining who I was as an artist, what I do, the material I was using and why I was using it. I would go through random neighborhoods and then just drop off letters essentially just asking if the had any leftover paint just stored in their garage or under their sinks that they didn’t want and they would leave it out on their driveway and I would pick it up the following weekend. And that worked really well, like the very first time I did it I wasn’t sure if it was even going to work, and then I got 20 gallons out of not even a full block of houses that received the letters. And sure, they’re not even full, and some of it is even bad, it’s not even good paint. But at the same time I have continued to use the used house paint as an idea of recycling as well. So even if its paint thats gone bad I’m okay with taking it because I will just dispose of it properly. Whereas people, even if they know how to, it’s a hassle to properly throw it out so they just keep it stored in their homes and at some point they will just throw it away which is bad for the environment. So this way, I feel good about using the donated house paint and house paint in general. SB: So is this kind of where the idea of memory came from? Seeing the old plans that people had for the paint, or was that already a thing for you? JL: No I think the memory thing at least for this show, started with just this last year I’ve been in Nashville. I’ve only been here a year. It is very much this transitional period of being done with school for good. It’s the first time I haven’t been in school. Just figuring all that out, how to have a full time job, while maintaining a studio practice. Whilst maintaining a social life! So in this one year there has been a lot I’ve needed to figure out. And deciding to move to a place where I didn’t know anyone was an added challenge. So the idea of the memories was based on the experiences that I’ve had within this last year living in Nashville. But I wanted these ideas to be general and be able to reflect on anyone. SB: How did you come to the paint roll? Was that an accident? JL: No that actually was based on procrastination. Throughout the first year of grad school it was just experimenting with the paintskin material. I would drape it, make huge sheets and peel it all into one big piece. I would stretch them over other things, I was doing some rolling but it was larger pieces. I was still thinking of it as this repetitive action of rolling. During this period was working on all these large projects that I believed to be the right direction but then I would get tired of it. While in my studio I would find scraps of the skins on the ground and I would start rolling them up. This was a way to procrastinate from what it was I believed was my “actual” projects. So I would spend a half hour, at least, rolling up the paintskin very carefully. I would carefully cut the end and carve into them, so I was doing this to take up time and relax and after a while it stopped being procrastination and became a way to take a break from the other experiments that I was doing. I just slowly kept adding to them, and the more I had the more people kept wanting to talk about them. They would see them in the corner of my studio and be intrigued and want to know more about them. Every time I would just say no that’s just for me, that’s not my real work and ignore the question and steer them back to the real work I was trying to make. That summer between the first year and second, I was thinking of what I wanted to do for my thesis show. I knew I wanted to do something big and very challenging. I wanted to do something that was going to take the entire year to make. After reflecting on the critiques from that first year I remembered all the comments about those small rolls and said okay, I’m going to make 10,000 of these rolls. I came to that number based on how many I had already made. I was trying to find that perfect number of how many I could possibly make in a year. By no means did I want to hit the number halfway through. I wanted to be crunching to the last possible minute. SB: Let alone, just the act of counting out 10,000 pieces of something had to be a bit of a challenge. JL: It was! Once I knew I was getting close to it I became smart about the counting. I was storing them in paint cans and I would write the number of them on the can and put it away. I was counting two or three hundred and then counting them from there. I think right now I would say I’m around 15,000. All the ones in this show are new, ones I’ve made recently. SB: Do you feel that this is something you are going to continue to do for a while, the rolls? Or will they evolve from themselves? JL: The rolls will forever be made. I don’t think I will ever stop making these rolls. I know I have a lot of other projects I want to do that don’t involve the rolls and I think that is most likely what will happen in the future. 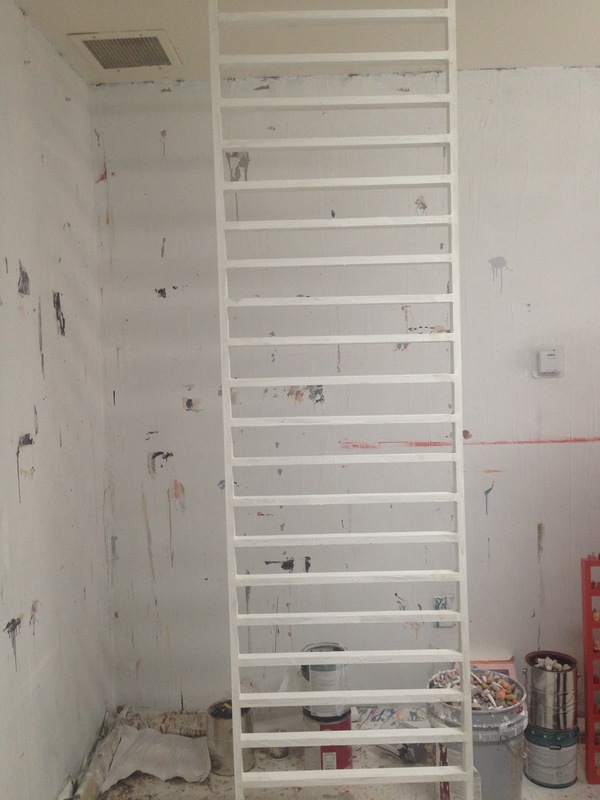 I will start to develop other projects, and still deal the house paint, paintskins. The rolls themselves, right now I’m still at the beginning stage. I still wonder what all I can make with these. I know even when I stop making these sculptural paintings and start working on the other paintskin projects I’ll still be doing these. It may go back to me creating these as a way to procrastinate. That’s still way into the future, I still have a lot of ideas of what to do with the rolls themselves. SB: That’s a really exciting place to be, to have so much potential. SB: That’s really interesting because there is no way you would ever be able to repeat one. JL: Right. And when I’m making them or just looking at them on their own I do think of them as characters or individual people because of that, because they’re all unique. As hard as I try there will never be two identical ones.